Whole chickens often take a long time to cook, but the simple method of flattening a chicken can reduce the roasting time substantially as well as make portioning easier. 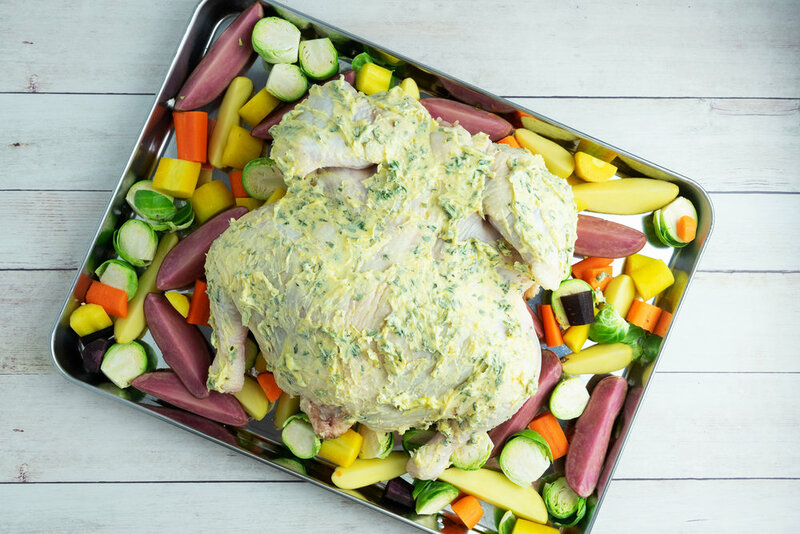 By combining the chicken and veggies on a baking sheet, everything will be cooked at the same time and there will be less clean up as well. Once you have mastered this meal, try using a similar method to use up whatever vegetables you have on hand for an quick and easy weeknight meal. 2. Place the chicken on a cutting board with the breast-side facing down and the wings and neck facing toward you. 3. Using kitchen shears or a sharp knife, cut along both sides of the chicken’s back bone to remove it. 4. Flip the chicken over and press down on the breastbone to flatten the chicken. You will hear a snap. 5. Season the inside of the chicken with 1/2 teaspoon of salt and 1 tablespoon of chopped rosemary. 6. In a mixing bowl and using a fork, combine the butter with the remaining rosemary, thyme, marjoram, garlic powder, onion powder and remaining salt until smooth. Stir in the lemon zest. 7. Spread the compound butter mixture all over the chicken until coated. 8. Place the fingerling potatoes, carrots and Brussels sprouts on a large sheet pan. 9. Place the seasoned chicken on top of the vegetables. 10. Roast uncovered until the internal temperature reaches 160 F (71 C), about 45-60 minutes.